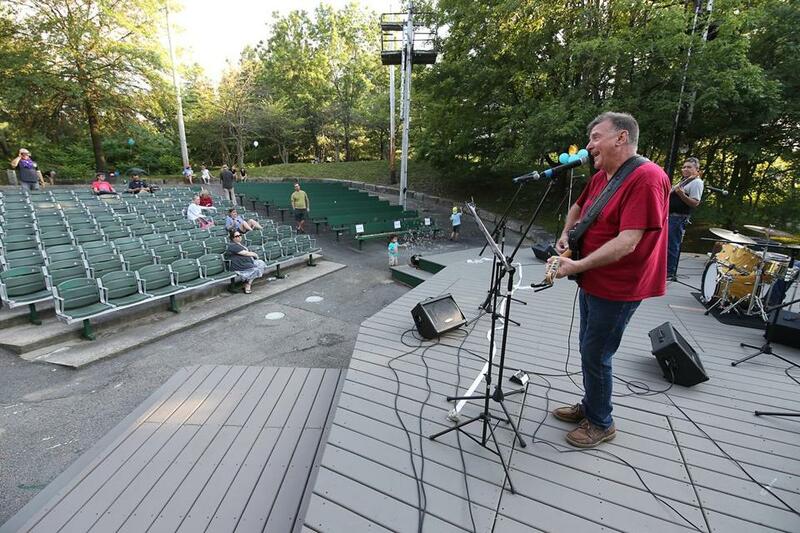 Tim McHale performs with his band during a reopening party for amphitheater in Christian Herter Park. Laughter and music filled the air on a July Saturday as children played in front of the stage. A machine sent bubbles into the breeze. Attendees wrote suggestions for programming on colorful notes and clipped them to a clothesline. Movies aren’t in the plans for Herter Park yet, but live theater, music, and children’s shows are all returning to a stage that has been silent for seven years. It took a combination of civic-minded folks, grants, and eager volunteers to revive the space that for decades had been occupied by the now-defunct Publick Theatre. Surrounded by a moat, the Herter Park amphitheater was built in 1959 as part of an ambitious arts complex that never came to fruition. 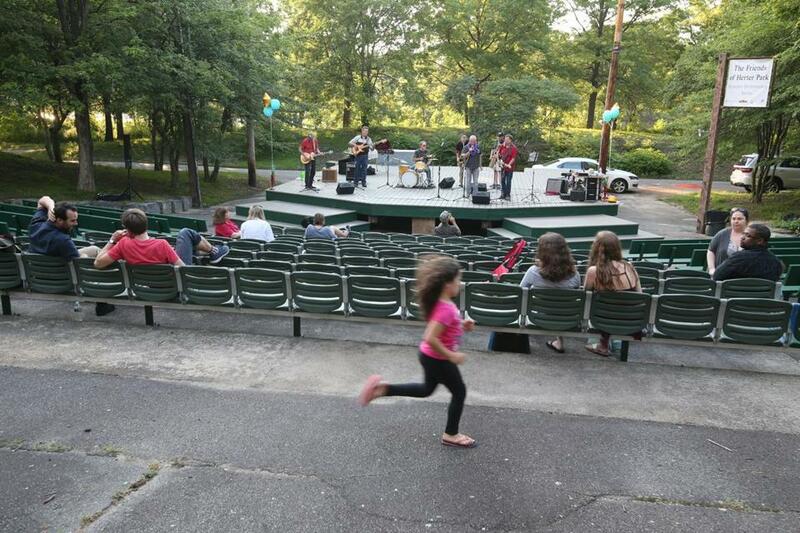 For 30 years, the Publick staged its summer performances at Herter Park, but in 2009 the company decided it needed a home that was easier for patrons to access and handed the amphitheater over to the Orfeo Group, which performed there for just one summer. Though the wooden stage was deteriorating and the seats were in disrepair, it wasn’t too long before the potential of the space caught someone’s eye. Herb Nolan, the deputy director of the Solomon Foundation, a nonprofit dedicated to improving Boston’s public parks and greenways, had been working on narrowing Greenough Boulevard across the river in Cambridge with the Department of Conservation and Recreation when he first thought about renovating the amphitheater. “I love restoring spaces and bringing them back to life, so I was really excited about the momentum there,” he said. Nolan began reaching out to community leaders to see if anyone was interested in renovating the amphitheater. In 2015, Nolan’s ideas caught Michelle Ciccolo’s attention. Ciccolo, who heads a firm that specializes in spearheading community development projects, sat down one afternoon and brainstormed what the space could be. She eventually created a nonprofit, the Friends of Herter Park, to submit grant applications and raise money. Although the DCR fully supported the restoration project, the agency could not provide any funding for renovations. In the end, the nonprofit raised approximately $96,000, including a $50,000 grant from the Harvard-Allston Public Realm Flexible Fund. The bulk of the money it raised was spent on construction, but the organization also set aside funding for programming and operations. McHale performs with his band during a reopening party for the amphitheater. Ciccolo reached out to the Charles River Conservancy, a nonprofit focused on enhancing parklands around the river, to see if the group could help organize cleanup dates in 2016. Eight cleanups later, the 350-seat amphitheater is ready for the public. Volunteers repaired the stage and replaced seats. They also cut foliage and removed weeds on the grounds surrounding the amphitheater, creating space for an additional 200 people. Live theater will return Aug. 11-13, with evening performances of “Hamlet” by the Brown Box Theatre Project. Kyler Taustin, the director of “Hamlet,” said Brown Box was excited to add three performances at Herter Park to the company’s tour because the amphitheater has always been a place where people congregated, even before the renovations. Taustin said Brown Box was a good fit for the amphitheater’s first performance because the company is used to providing its own equipment as a touring theater company. The Friends of Herter Park is currently working on installing sound and lighting equipment. Tim McHale, the head of site improvements for the Friends of Herter Park, said the renovation project appealed to him because he’s also a working musician. It’s in his blood, he said, to spread music in the community. One of the most striking things about the amphitheater is how intimate it feels, despite being able to accommodate hundreds of people. Lush trees stretch into the sky and provide shade for visitors. Despite its unique location, the space never fulfilled its potential, according to Nolan, but he hopes that’s going to change. The Herter Park ampitheater was in rough shape before the cleanup.